A group of us came together to celebrate a friend who is about to have a baby. It was not a baby shower but a mommy party in the Indian fashion. 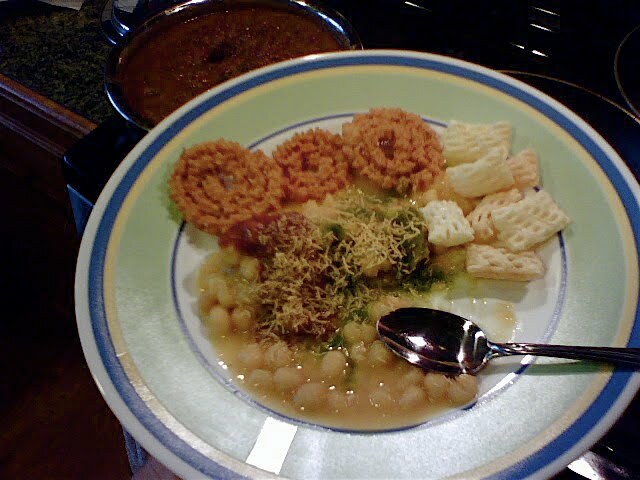 Hosted by Manisha, it of course included her amazing cooking, including ragda patties and other yummies. I wish now that I had taken more and better pictures; my documentary skills are rusty. But I also was having such a good time! We had a ceremony in which each of us presented the mom-to-be with symbolic gifts and showered her with rice and spices (literally). 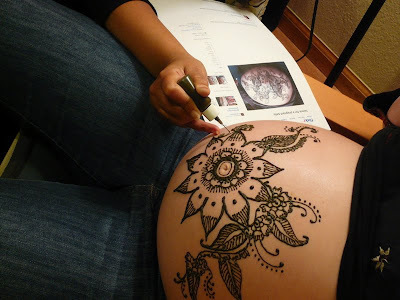 Manisha brought in two friends who do henna tattooing to decorate the baby belly and the hands of the guests. The henna goes on as a dark paste, applied through a needle-nosed bottle. It smells strongly of eucalyptus. The artists are quite talented, and fast! I took this with my cellphone. My tattoo had to be on the back of my hand, since I was driving home. 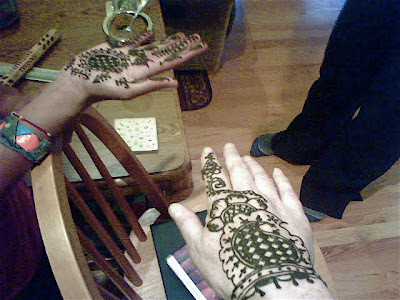 Others got the tattoo on their palms. The paste is allowed to dry, then covered with a mix of lemon and sugar. The acidity helps darken the design; the sugar helps the paste stick. You leave it on for as long as you can, then scrape it off. I did so before I went to bed. 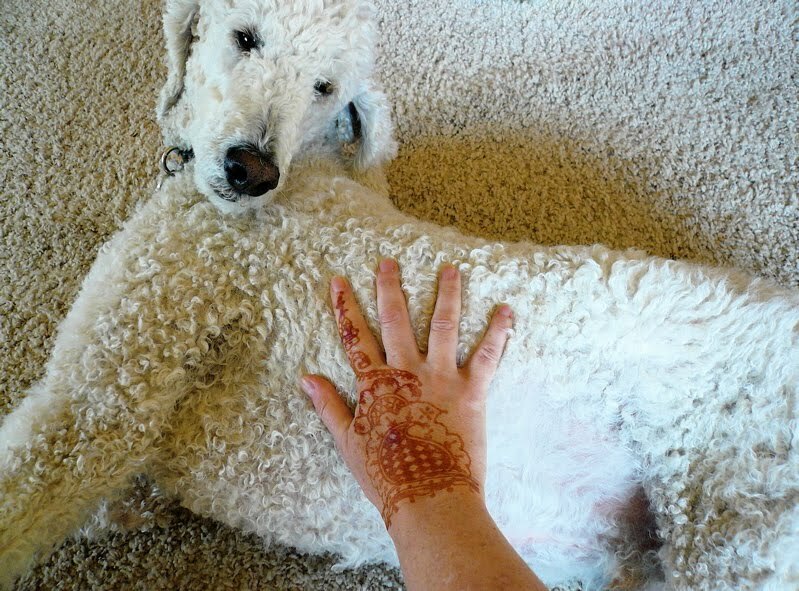 When I woke up today, the stain had darkened considerably. It will continue to darken today, if I can keep from getting it wet. Then it will last for a couple of weeks. Jackson is happy, because it means his bath will be delayed. He really needs one; he now matches the gray carpet. I have slowly been working through the process of changing my name. 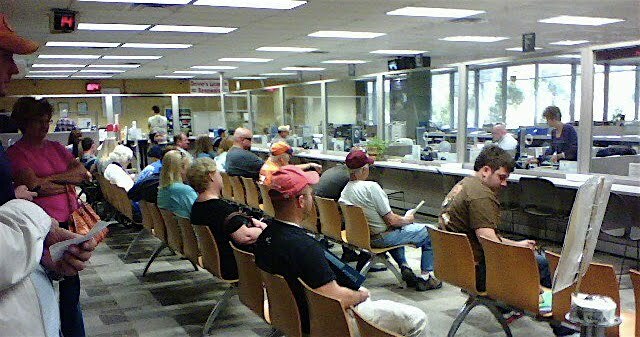 After a couple of false starts I finally made it to the Littleton DMV. They made me take my glasses off for the photo. It's all computerized so they have exact measurements of your features. 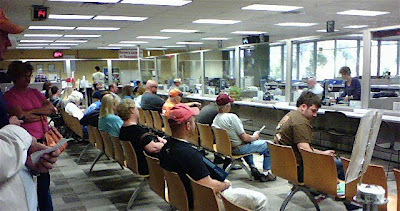 I didn't see the photo; they'll send me the license in the mail. I hope it turns out OK.
An old friend was in town last week and she wanted to see the new Tattered Cover Book Store on Colfax. My plan was to then head over to Cuba Cuba for mojitos and dinner, but there was Encore beckoning to us from right next door. 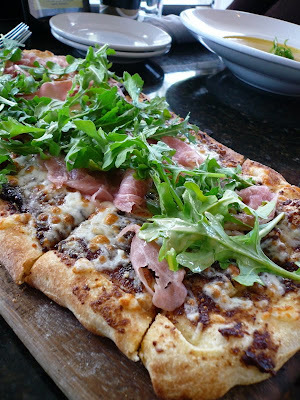 I had the Fig & Pig flatbread pizza: prosciutto, fig jam and arugula, with gorgonzola added. Quite tasty! 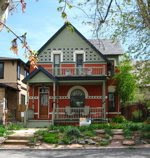 And the service was great: friendly, efficient and very accommodating. You could have an awesome marathon date in that one little shopping complex, especially with the Denver Film Center soon to open there. After I posted about tacos al pastor a couple of weeks ago, I did end up going to Tacos y Salsas to check out their offering. 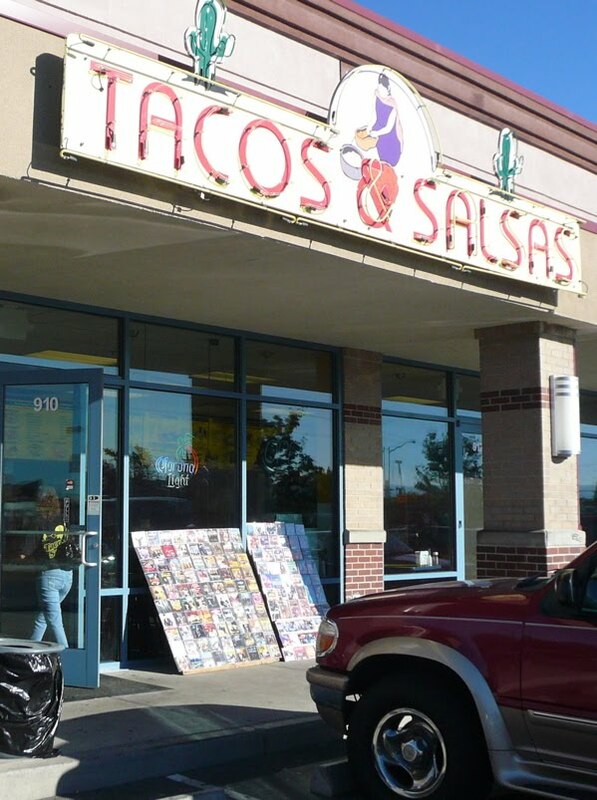 This taco chain is a little more slick than Tacos Veloz, with several locations in Denver and in other states. I went to the one at 910 South Federal. It's on the east side of the street, at Kentucky Avenue, in a little strip mall. The place is clean and bright, with lots of seating, and the service is speedy. Place your order at the counter and they'll bring it to you when it's ready. 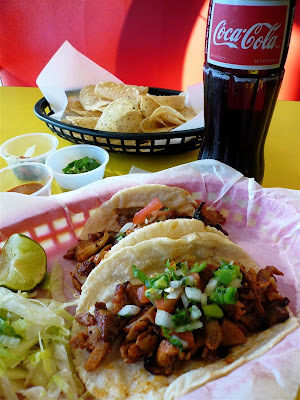 I ordered tacos al pastor and a Coke. The tacos are tasty, but too light on the pineapple. If I go again, I'll ask them to put more on. 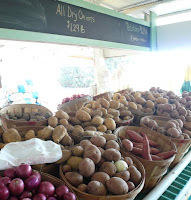 You also get a basket of chips with your order, and can try a variety of salsas from the salsa bar. And the Coke is in a giant glass bottle  500 ml. Decadent! This meal was about $5. 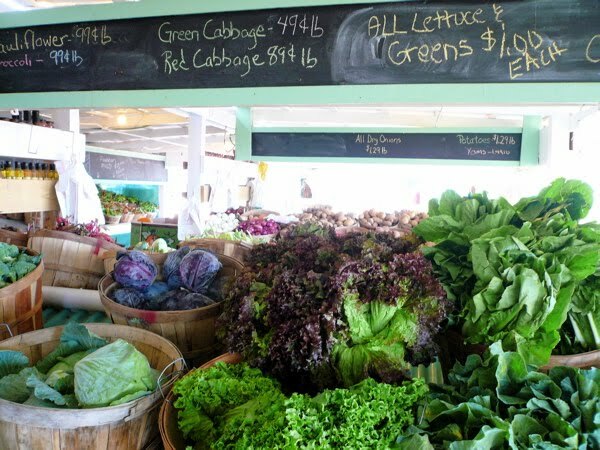 Starting in late August, the chile stands start popping up around town. Chiles from Hatch, New Mexico, are the most famous and delicious. 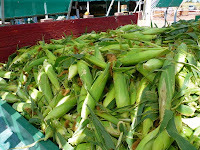 Many of the stands are just a couple of guys with a truck full of burlap sacks and a roaster, setting up shop in a vacant lot. 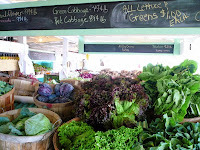 You can also buy the chiles at farmers' markets. 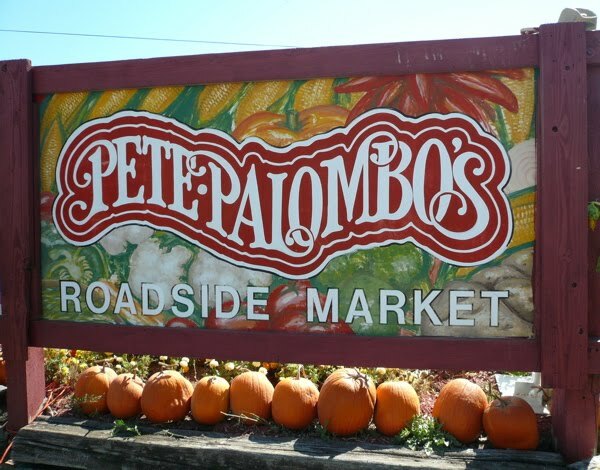 Since I was on the north side of town today, I decided to check Pete Palombo's market on a cow-orker's recommendation. Her parents buy bushels of chiles there every year. Pete's is in Brighton, on the northwest corner of U.S. 85 and East 144th Avenue. 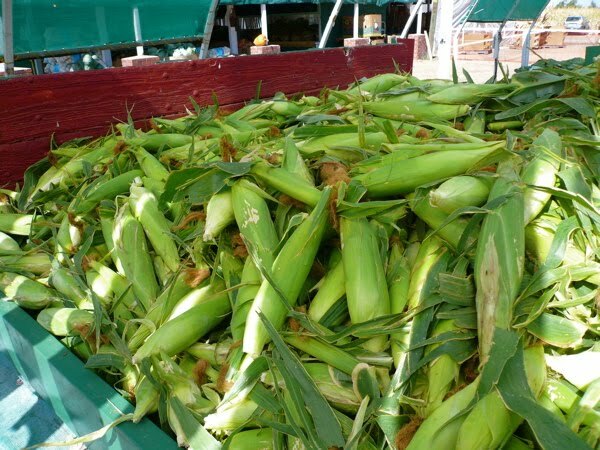 In October, they have a corn maze, too. 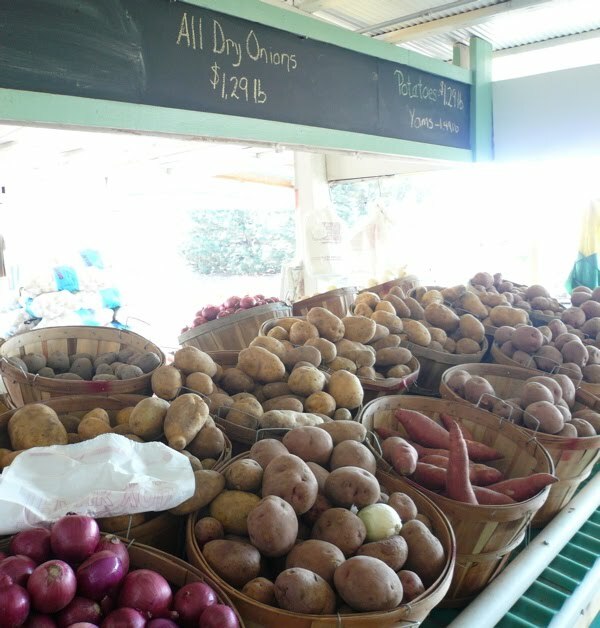 You can get all kinds of fresh produce at Pete's: corn, pumpkins, potatoes, onions, greens... 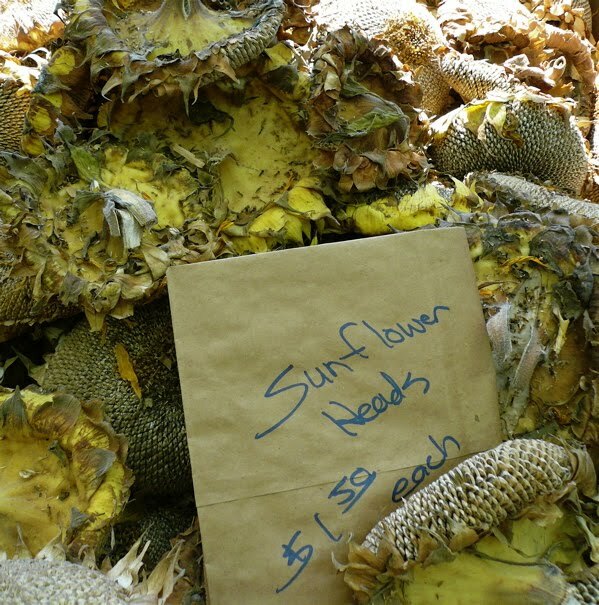 Even sunflower heads for roasting seeds or feeding to the birds. 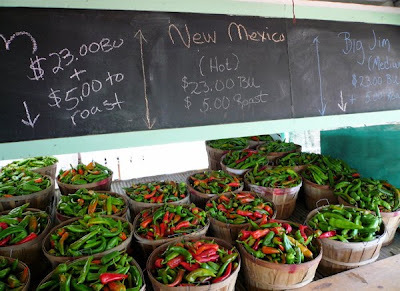 They have many varieties of chiles, with varying degrees of heat. 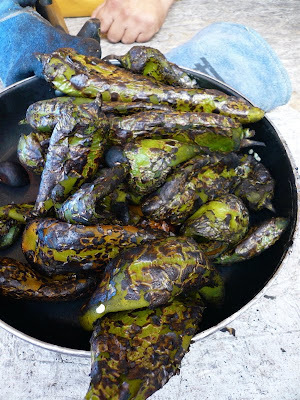 This late in the season, though, even the "mild" chiles have a bit of a bite to them. I ordered half a bushel of the milder Anaheims and got in line for the roaster. The roaster is a big mesh barrel with a line of gas burners. The chiles are tumbled past the burners. Gabe is a neighbor of the Palombos who helps out during the week. He's in the construction business, but business has been slow. 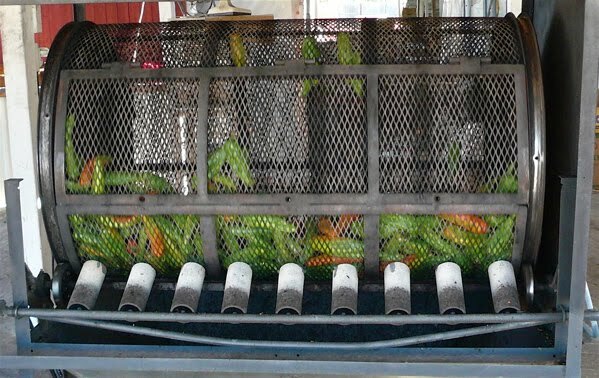 He roasts up to 40 bushels of chiles a day. He suggested I toss a broken-up head of garlic in with the chiles for a little extra infusion of flavor. Boy, did that ever smell good. 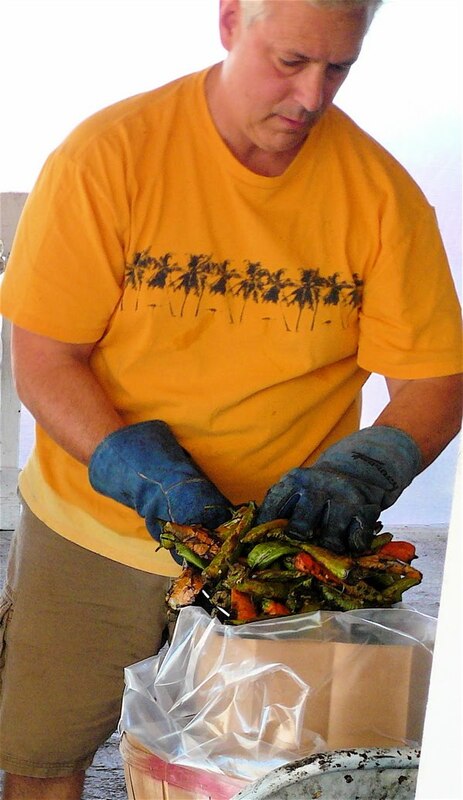 Once the chiles look done, he pulls out a panful so you can check them before he bags them. 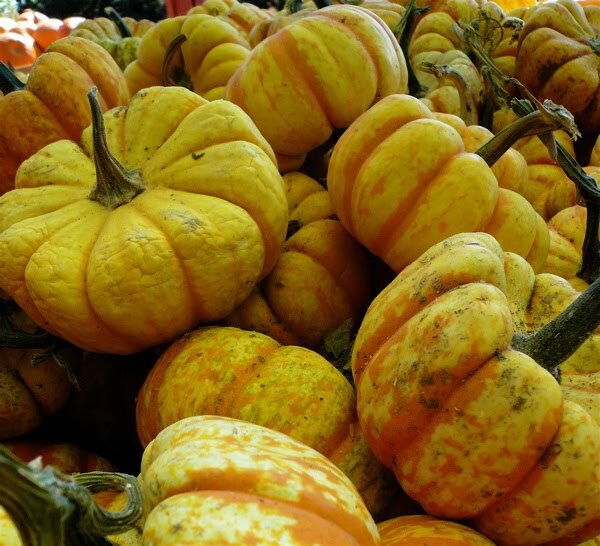 You want them cooked enough so the skins pull off easily, but not so cooked that they turn to mush. Once they go into the bag, they will steam a little more. A half-bushel may sound like a lot of chiles, but they freeze well and can be used in cooking all winter. 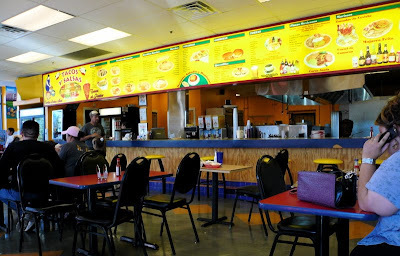 They're good on grilled cheese sandwiches, on hamburgers, in posole and of course in a big pot of New Mexico green chile stew. Yum.